In Reason there are two quite distinct ways of sequencing drums. 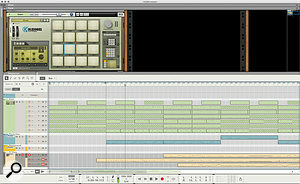 The classic approach is to use the Redrum drum machine with its integral manually programmed step sequencer (which we’ll look at at the end of this article). Alternatively, if you want to use Kong or one of the sampler instruments as your source, or if you prefer to play in your patterns live, you need to work with the main Reason sequencer. We’ll focus mainly on this latter approach as Kong is probably where you want to be these days; it’s a much more sophisticated instrument. What follows is a particular way I like to work because it gets lots of ideas down quickly, and leaves you with a fast and easy way to arrange your song. 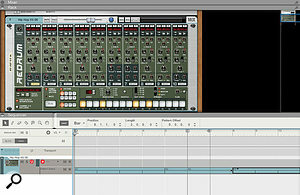 Screen 1: All set to capture the drums.The technique I want to share uses multiple track lanes to build up patterns and parts, each of which are independent sequencer objects, but play the same instrument. This is partly because it’s difficult to emulate the drum machine (or Maschine) approach of creating whole pattern variations in a fast and fluid way. However, this method has some unique advantages: you don’t need anywhere near as many patterns to create a lot of variation, and you get the advantages of a multi-track-style workflow managed in a single track. In screen 1 I’m all ready to go. 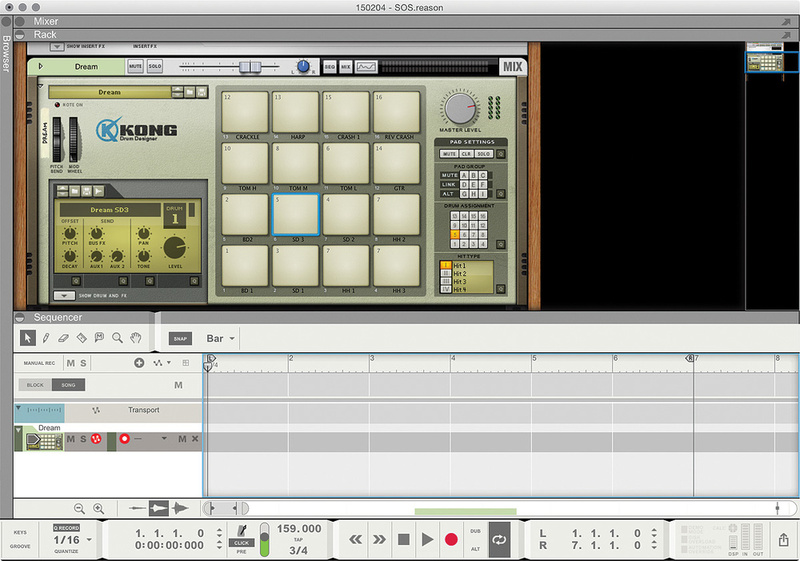 I’ve loaded a Kong patch, set a six-bar loop (in 3/4 time) and enabled transport looping. The Click is on, and the Tool Window is open for easy access to Quantise functions. Now, to really make this process fly you should be acquainted with the keyboard shortcuts listed elsewhere on this page. When you’re all set, hit Play and start playing with some ideas from your MIDI keyboard or pads. Once you’ve got the basic foundation of the loop (say, kick and snare) worked out, hit ‘*’ on the keypad to drop into record and capture it as best you can. Hit ‘*’ again to drop out of record without stopping playback. I like to leave the Quantise Notes During Rec option active, with the Amount set to 90 percent. If your timing is less hopeless than mine, you can leave this off, and if you need to Quantise after a pass just hit Cmd-K — the most recently recorded clip will be selected so any functions like this will be applied to it. 2: Song Level arrangement after Muting clips.Next hit ‘3’ (or comma) on the keypad and a new lane will be created in the sequencer, and will be armed for recording. Now you can layer up another part to the pattern. This differs from more traditional workflows where you effectively overdub all parts into the original clip, and is the key to fast arrangement. Keep going until you’ve built up all the drum components that you think you’ll use in your song. If you want to make a variation of any particular part you can hit 4 (or ‘.’) to make an ‘Alt’. This does the same as Dub but mutes the previous clip. If you want to make variations of another part, or multiple parts, you can use the Up and Down Cursor keys to move the clip selection between the lanes then the M key to mute the original. All of this can be done without stopping, and without touching the mouse. What you’ll be left with is a stack of clips within the Kong track, containing the various component parts of your drums. The quickest way to start making an arrangement is to duplicate this stack multiple times down the timeline, then start chipping away at what’s there. If you’ve recorded in Song mode, you can simply select all the clips and use Cmd-D/Ctrl-D to duplicate. If you’re a Blocks user, and you did your recording in this mode, you can ‘paint’ the Block into a long section of the Song. Now you can make your arrangement by using the M key to mute out the parts that you don’t need in each section of the Song. You can see the result of this in screen 2. Notice that I’ve used a similar technique in a couple of other tracks to capture different variations of some synth parts that I’ve then used in the verse and chorus sections. This ‘subtractive’ arrangement workflow can be really quick as it reduces a lot of copying and dragging of clips around with the mouse. Creating drum patterns with Redrum’s step sequencer is initially more ‘mousey’: you can’t record your patterns in live. However, once you have patterns, you can ‘perform’ an arrangement into the main sequencer by recording pattern changes in real-time. 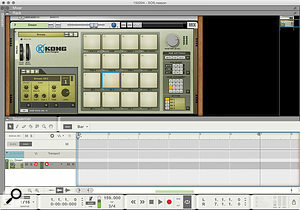 Conversely, using Kong (or other samplers) you can record patterns freely in real time, but song-level arrangement of your parts must be done with manual editing. Here’s a recap on the Redrum method. 3: Redrum pattern sequence.Redrum’s step sequencer has four Banks of eight memory slots, A1 to D8, accessed from the bottom of its control panel. Each slot stores the complete pattern for all the sounds in the Redrum, and only one slot is active at a time. Therefore you need to store a separate slot for every drum combination you’ll use in the Song, rather than layering as we did in the main article. Once you have all your variations stored, you can use the Song sequencer to arrange which pattern is active at each point during the song. The nice aspect of this workflow is that you can do this by editing, or real-time recording, or a combination of both. In this respect it’s similar to the way you can make a Song arrangement in Ableton Live or on some classic drum machines. To arrange in real-time, simply record-arm the Redrum in the Sequencer, start recording, then ‘perform’ the arrangement by recalling the patterns on the Redrum’s Pattern Selector. Changes are quantised to the next bar. A Pattern Select lane will appear in the track showing the changes. To draw in pattern select data, switch to the Pencil Tool then use the Pattern/Loop pop-up in the Sequencer toolbar to choose which pattern to draw. If you haven’t already recorded any pattern changes, you’ll need to right-click in the Redrum track and choose Create Pattern/Loop Lane. You’ll probably want to have the Snap setting set to Bars for this to work properly or your drums will go out of sync. The following table lists the essential keyboard shortcuts for fast mouse-free pattern recording. It helps to have a keyboard with a numeric keypad, but there are equivalents to most keys if you’re on a laptop. Reason veterans were probably expecting me to suggest using the Sequencer’s Blocks feature, which, at least according to the manual, was inspired by drum machines. There are certainly some similar ways in which you can use Blocks, and we’ll cover this whole subject in detail another time. The reason I’ve suggested an alternative this time is that it’s not possible to work with Blocks without regularly resorting to the mouse. There’s also no Duplicate Block function, so for a non-stop, looping workflow, it’s not quite right. However, you could have used the workflow here within a Block, or different Blocks. Also, if some structures start to appear in your arrangement, such as a verse or chorus, you could move them into Blocks to speed up further arrangement.